ThermoShield will make your sleep time more comfortable, more enjoyable, and save you money every month of the year. The secret is in our 2" thick pad construction. A soft foam cushion underneath our special fiber, packed to maximum capacity for a comfort and softness that you can hardly believe. These fibers trap air which helps to naturally insulate, thus keeping you warm in the winter, and cool in the summer. 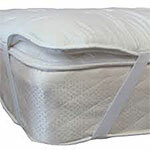 ThermoShield Pads work so well, the manufacturer backs every pad sold with a 30 day guarantee; if you do not sleep better within the first 30 days, you can return it for a complete refund. It is also backed by a full year warranty, covering defects in material or workmanship. If defective, repair or replacement will be made at the manufacturer's option. Elastic bands on each corner of the pad keep the pad securely in place and prevent shifting or bunching up. The ThermoShield pad is also proudly made in the U.S.A. The ThermoShield is constructed from 2 layers that together make up the 2" thick pad. A 3/4" high quality soft foam cushion underlays our special fiber, packed so full that it literally explodes when we cut the ThermoShield for you to see! These fibers trap nature's best insulator - air - to keep you warm in the winter, and cool in the summer and softer year round! The cover on the pad is made from a polyester fabric designed to aid in insulation. 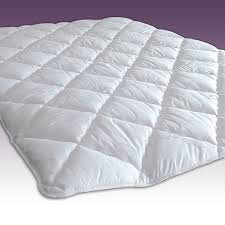 The ThermoShield pad is the ideal solution to make any mattress more comfortable instantly.